The television industry is celebrating after winning 11 trophies at the Bafta Cymru Awards 2010. At the Wales Millennium Centre in Cardiff, S4C scooped 14 awards and the BBC won in a range of genres, including sport, drama, news and current affairs, interactive and factual. Huw Edwards was named Best On-screen Presenter for The Prince and the Plotter, a factual programme about the investiture of the Prince of Wales, while Bryn Terfel's Snowdonia was named Best Music Programme. Menna Richards, director of BBC Cymru Wales, said the awards were a tribute to the "very talented people" behind them. In drama, three of BBC Cymru Wales' network series - Torchwood, Doctor Who and The Sarah Jane Adventures - were honoured at the star-studded ceremony, hosted by Cerys Matthews and Aled Jones. 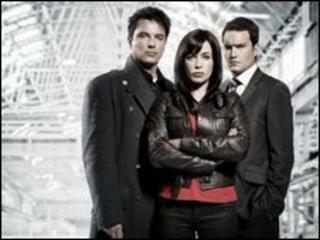 Torchwood: Children of Earth, produced by Peter Bennett, took top spot for Best Drama Series and Best Editor for Will Oswald. Doctor Who scored in the Best Design and Best Make-Up categories, while the website for The Sarah-Jane Adventures won Best Interactive. S4C film Ryan a Ronnie, about the life and careers of the legendary entertainers, was the big winner, collecting four trophies for best actor, best director of a film/drama, screenwriter and photography direction. S4C took a further 10 awards, including Best Actress for Cwcw's Eiry Thomas. The comedy A Bit of Tom Jones? starring Margaret John, Eve Myles and Jonathan Owen, was named Best Film, while Dylan Richards was Best Director for his work on Carwyn. Best Camera (non-drama) was won by Wayne Derrick, who travelled to the Arctic Circle with Sir Ranulph Fiennes and John Simpson for Top Dogs: Adventures in War Sea and Ice. Gareth Jones, who won for Frontline Afghanistan in the Best Factual Programme category, dedicated his Bafta trophy to the Welsh soldiers fighting on the frontline. BBC Cymru Wales' flagship rugby programme Scrum V Live took the trophy for Best Coverage of a Live Event, while One Family In Wales was named the Best News and Current Affairs programme for its stark portrayal of poverty. Ms Richards said: "I am thrilled to see so many BBC Cymru Wales programmes picking up such well-deserved awards, and in such a broad range of categories. "They are a real tribute to the very talented people who strive to produce such high quality and distinctive content for BBC Cymru Wales - programming that's enjoyed not just in Wales but across the UK and beyond." Comedian Rob Brydon was honoured with the Sian Phillips award for his "outstanding achievements in network television and film". "I've not won an award in Wales since 1984, Porthcawl Comprehensive Drama Student of the Year, so I'm both delighted and relieved this fallow spell has come to an end," he said. John Hardy won his fifth BAFTA Cymru award for Best Original Soundtrack Music, taking the award home for the third year in a row. His award was also for Cwcw, a relationship drama written, produced and directed by Delyth Jones.